We've been a bit quiet in the blogasphere for a while now, but it's all been for a perfectly good reason - the birth of our own little Rani! As a family business we've learnt to juggle quite a few different tasks and parenthood is definitely the hardest one so far! We've still been dispatching all your orders, and have been busy getting inspiration for new products. 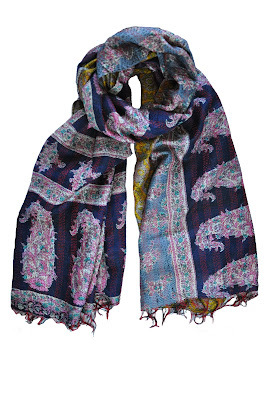 This week we are providing Stag and Bow with a whole new collection of our lovely vintage kantha quilts. We'll update you once they have them in the shop so those of you who are local to Forest Hill (London) can pop in and see our quilts for yourselves. Happy shopping! 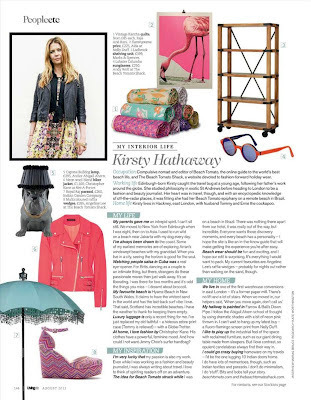 You'll find our quilts featured in a few magazines this summer! The Moroccan theme is still going strong in interiors and the feature in the August issue of Living Etc showcases a fabulous home near Marrakech filled with traditional Moroccan detail with a modern twist. Our vintage kantha silk quilt has been featured as a way to get a taste of the moroccan vibe in your home with it's rich colours and patterns. Continuing the global theme, the August issue of Living North magazine has a great feature on well travelled interior pieces for your home. 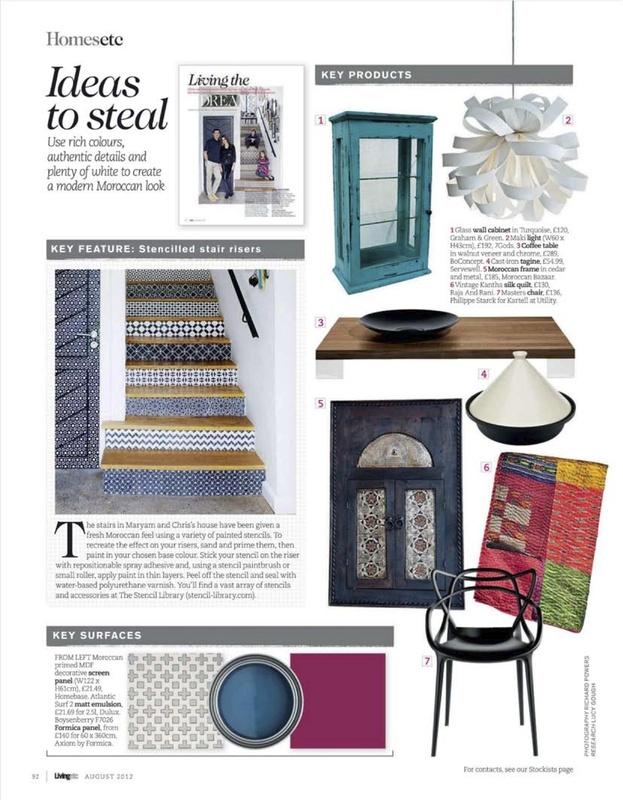 Our favourites include these oriental style floating candles from Habitat and authentic hand painted tiles from Fired Earth. 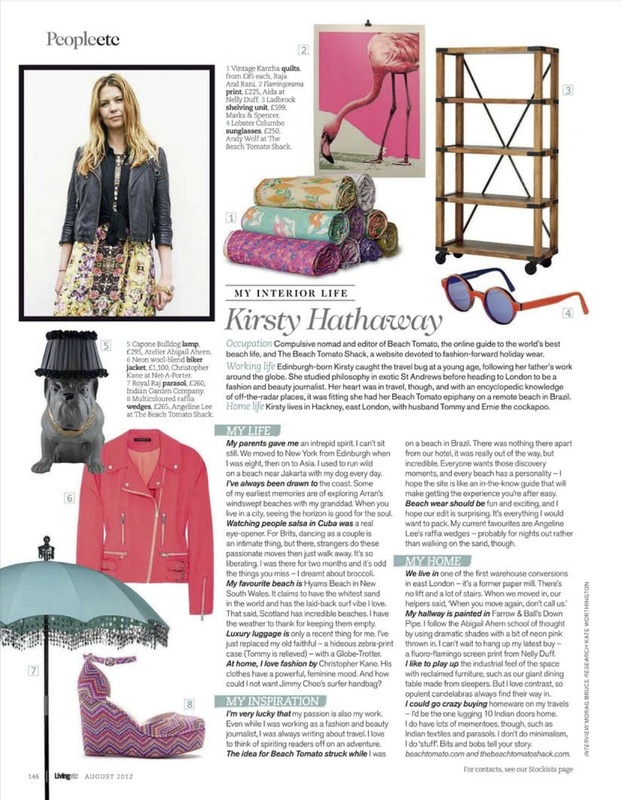 Of course our vintage kantha silk quilts get another mention too! Bright and colourful plays a big part in the Spanish home featured in BBC Homes and Antiques. Every textile in this home is bold and vibrant - just what we like! 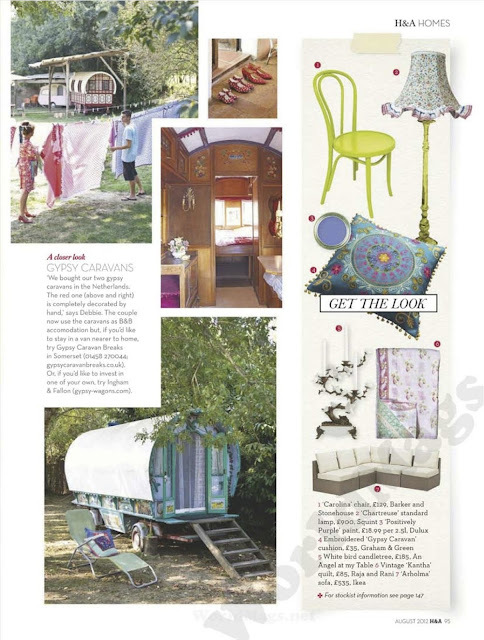 One of our vintage kantha quilts from our summer 2012 collection is featured in this article. We are pleased to announce that our products can now be bought from Stag & Bow in Forest Hill. Stag & Bow is a quirky jem of a shop in the heart of Forest Hill focusing on craft, history and haberdashery as well as running regular workshops in knitting, printing and lots more! Pop in to see our range of kantha cushions and quilts at 8 Dartmouth Road, London, SE23 3XU. 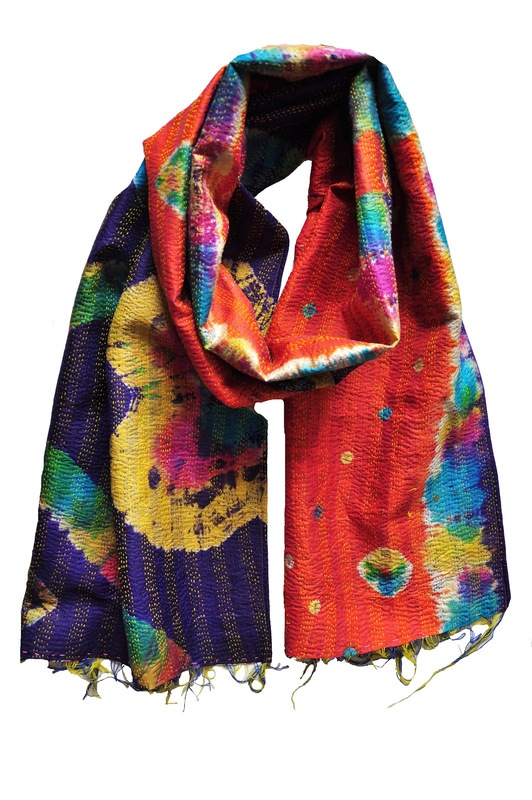 Our vintage kantha silk scarves and shawls make the perfect gift for your Mum. Soft, silky and in a vibrant range of colours and prints, these scarves and shawls are a great way to add a pop of colour to any outfit! Handcrafted from vintage silk saris, and with a different design on each side, makes them really versatile! 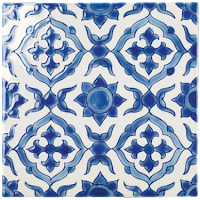 Browse our ranges here and here. 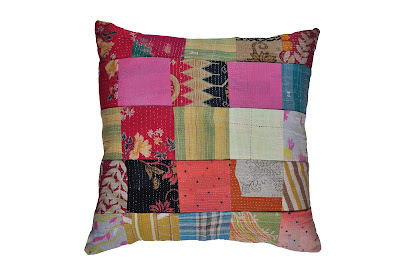 We've been beavering away on our website to make it even easier for you to buy our vintage kantha cushions. It's taken some putting together, but now you can hand pick the design you want rather than us selecting one for you. Images of the front, back and detail of the design can be seen for each cushion. 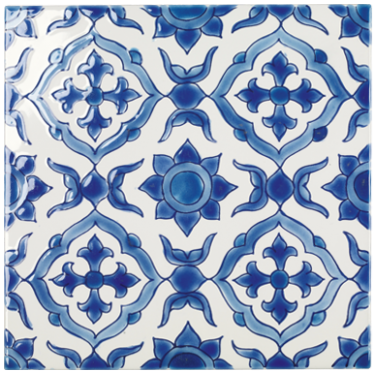 We've got lots of lovely designs in stock, but as they are all unique, once they're gone, they're gone! The links to get you started are here and here. I never like to get caught up in the whole Valentines Day 'thing' but… if it's an excuse to make some yummy food then I'm in! For me, the best part of any meal is always the dessert (true, right?) 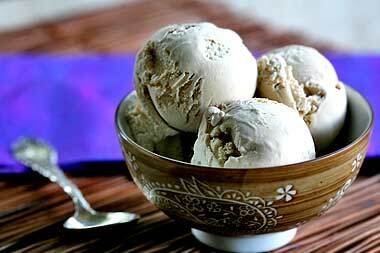 and I've been waiting for an excuse to make this gorgeous yummy recipe for Masala Chai ice cream. It's smooth, creamy and with a hint of spice - perfect! I hope the other half likes it - I have a feeling he will! 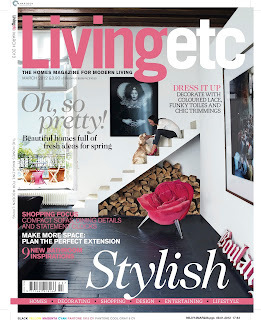 Our vintage kantha quilts are featured in the March edition of Living Etc magazine. 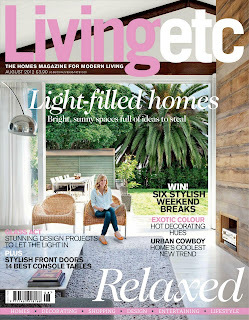 We are so pleased with the 'Living Etc Loves' accolade!